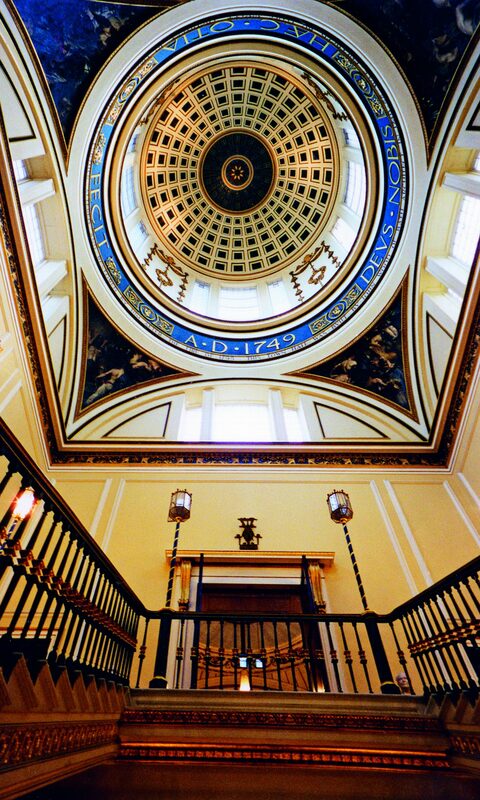 Liverpool’s grand Town Hall was first designed as an ‘exchange’ by John Wood of Bath and completed in 1754. Alterations followed later in the 18th century by John Foster Snr. and James Wyatt. 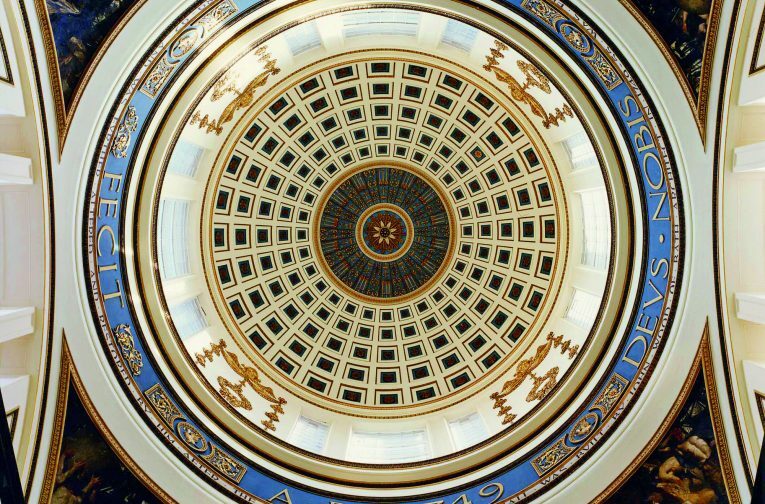 Then, after having been devastated by fire in 1795, it was rebuilt internally to designs by Wyatt, who also added the dome and portico during the early years of the 19th century. The engagement of such eminent architects and its external scale and internal magnificence testify to the wealth and importance of the city during the late Georgian period. 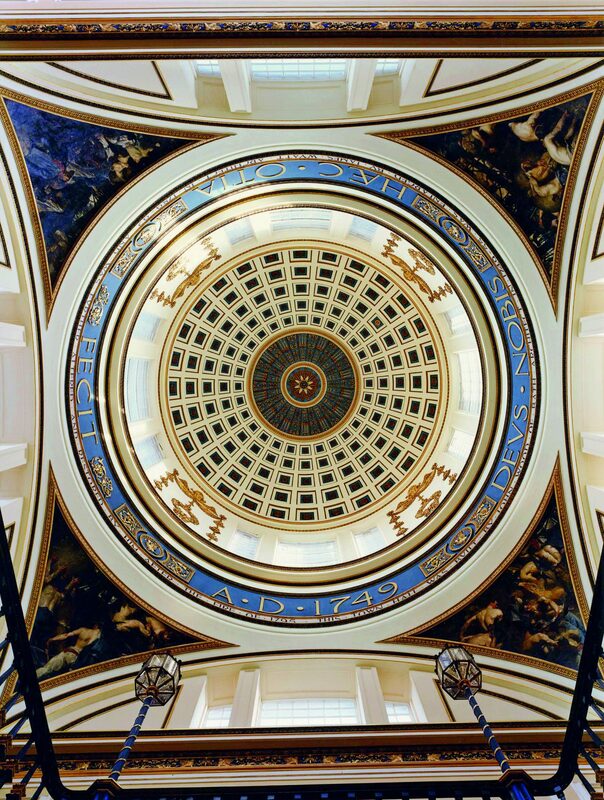 As part of a wider project to repair the external fabric and return the town hall to beneficial use, Donald Insall Associates completed a major internal refurbishment of the principal first-floor rooms — described by Edward VII as “one of the finest suites of rooms in Europe” — and of the grand staircase hall. Original coloured drawings by Wyatt, paint analysis and colour cues from 1835 and furnishing inventories provided the basis for the redecoration proposals. To make the building meet the latest functional, fire safety and statutory requirements, a range of interior alterations and interventions were devised. A modern catering facility was installed in the basement, servicing banquets for up to 300 persons. Additional and enhanced lavatory accommodation was provided in various parts of the building and fire protection upgraded. All of these works involved discreet and sensitive design so as not to detract from the exceptional historic interiors. An essential feature of the renovation was that of making the building more accessible to persons with mobility and sensory impairments. Ramps were constructed at the main and east entrances. 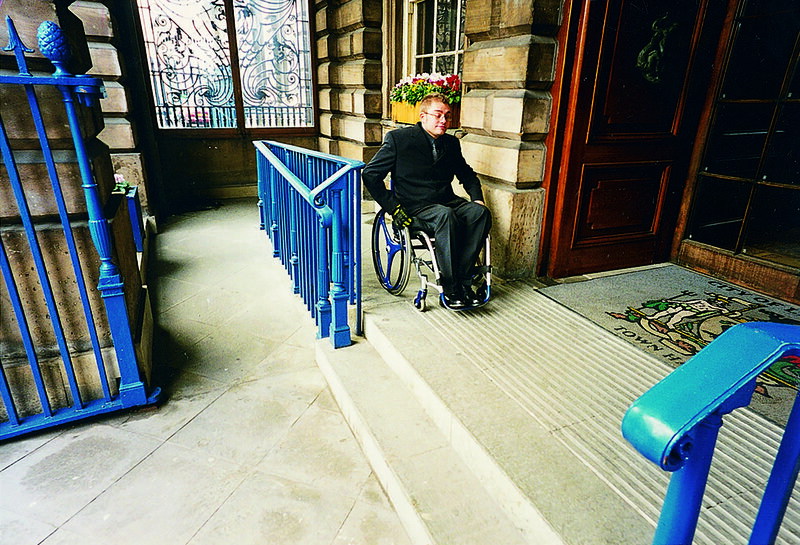 Accessible toilets were provided at all principal levels and a new wheelchair-capable lift installed. The completed works dramatically revived the appearance of the historic interiors and have enabled a far-greater intensity of use and accessibility for the building to become a ‘front door’ to the city.